Welcome to Second Chance Tuesday where I highlight something that should have a second look. I usually post about an item once and then I'm on to find the next treasure. There are some oldies but goodies still available in my ever growing inventory that you may not have had a chance to see. Like this. Today I looked in my Bella Rosa inventory and saw this lovely oval framed print. 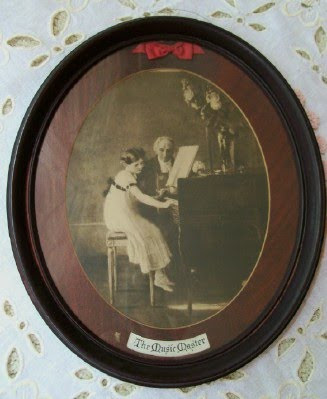 Very old and just a lovely piece titled "The Music Master." I just love the sweet little bow underneath the glass at the top. You can find it in my Home Decor category on the Bella Rosa Antiques website. I'd also like to say THANK YOU ... I've reached 200 f0llowers! How exciting. wow - 200! I'm no where close to that. Congratulations. And that picture is indeed lovely. Congratulations Jillian on your 200 Followers! Congratulations on your 200 followers! Wow!